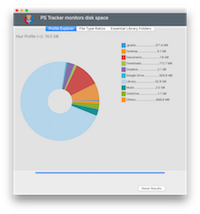 PS Tracker monitors disk space. It helps you to be aware of your profile size and thus your hard drive usage. Nowadays, we run out of space easily while working on different projects or synchronizing our mobile device(s); not to mention faster but smaller SSD drives. Avoid unexpected crashes and freezes, as hard drive gets almost full. Note: Your Mac needs adequate hard drive space to operate normally. A low amount of RAM requires more drive space for Virtual Memory's swap files. This tab displays information related to items (files and folders) stored in your profile (denoted as ~/). Particular attention should be placed to section named Others since Others section contains folder and files whose size is too small to be shown graphically. Graph is updated as you delete an item. You are encouraged to explore your own files graphically! This tab displays information related to group of files that is images, Adobe Files, Video, Documents, Audio Files, and Others. 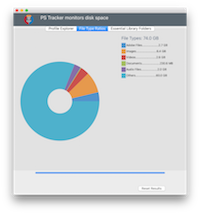 Section Others refers to remaining space on disk for files that does not belong to mentioned categories above. List of essential folders includes those folders that are commonly used by several application such as browsers, email clients, logs, etc. 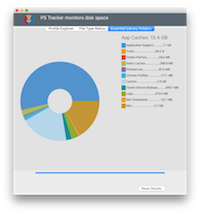 For Instance, Caches folder inside our profile library is a common folder one can delete to recover disk space.